One of my favorite cookies when I was younger was No-Bake cookies. Mix a few ingredients together and in no time you have a tasty treat without using the oven! I haven’t made that recipe for a long time and recently checked it out. Can you believe it has 2 cups of sugar and a full stick of butter? That’s way more sugar than I use in regular cookies. So not good for you. 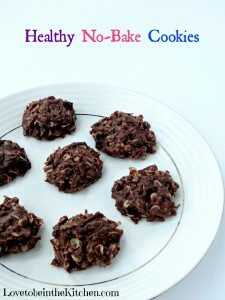 So recently when I came across the recipe for these Healthy No-Bake Cookies I was so excited to try them! It was really easy to put together, just mix a few ingredients together on the stove; honey, coconut oil, cocoa powder and a pinch of salt. Then mix in the peanut butter, remove from heat, add vanilla and oats. Let cool for 5 minutes then add coconut and optional flaxseed and raisins or chocolate chips. Scoop into cookies, chill, then enjoy! So easy and delicious! I added 2 tablespoons of flaxseeds to up the nutrition and it was great! You couldn’t even tell! I added mini-chocolate chips which wasn’t smart because it just melted into the mixture. Next time I will add chocolate chips. The recipe says to add raisins but I don’t like raisins so I figure chocolate chips would be a better substitute for me. I love that these cookies use honey instead of a crazy amount of sugar. And coconut oil instead of butter. I am loving using coconut oil lately. Did you know coconut oil contains high levels of lauric acid which is a saturated fat that raises levels of good (HDL) cholesterol? Pretty cool. Plus so many more benefits! What are your favorite recipes using coconut oil? This recipe is perfect for an after-school snack and fun to make with kids! Combine the honey, coconut oil, cocoa powder and salt in a medium saucepan over medium heat. Cook stirring, until the coconut oil is melted and the mixture is smooth, 2 to 3 minutes. Add the peanut butter; stir until completely melted, 2 minutes. Remove from the heat and stir in the vanilla extract then the oats; cover and set aside 5 minutes. Uncover and stir in the coconut and if using, flaxseed and raisins or chocolate chips. Line a baking sheet with wax paper. Using a spoon, scoop desired size of cookies onto cookie sheet. Use the spoon to shape the cookie and flatten a little. Repeat with remaining dough. Refrigerate the cookies until cold, at least 30 minutes. Serve chilled. These look amazing and more healthy than the ones I make! Do you know what the calorie and carbs and fat are. Thanks, must try this version. I’m sorry I do not have that information. There are many online tools available to help with this. When I made these I was able to get 14 out of the batter. I entered everything into my fitness pal and came up with 144 calories 136 carbs 10 fat and 11 sugars per cookie. They are yummy but I still feel like these are a little high for 1 cookie. Absolutely better than the original…..Thanks for sharing. It’s nice to have a treat and not kill the diet 😉 I made them today and they were yummy! 136 carbs??? I think you have a typo. Am I right? ? I have everything but the flaxseed, which I guess is optional, but I’ve never had it. Is it good? Sounds like a great recipe, love having the option of no-bake treats! Thanks! No-bake treats are fun! These were wonderful. I did make a couple changes for health reasons. I used almond butter rather than peanut. As far as the flax goes, you did not specify meal or whole, so I did meal since you get nutritional value from that form. Whole seeds are only good for fiber, at least that is my understanding. For some reason I needed to add almost 2cups extra gluten free oats. Which was fine, it just made more cookies. Made a great gluten free go to treat for my gf daughters. Thanks for letting me know the changes you made! Glad it was a great treat for your family! I did say ground flax seed, meaning meal.